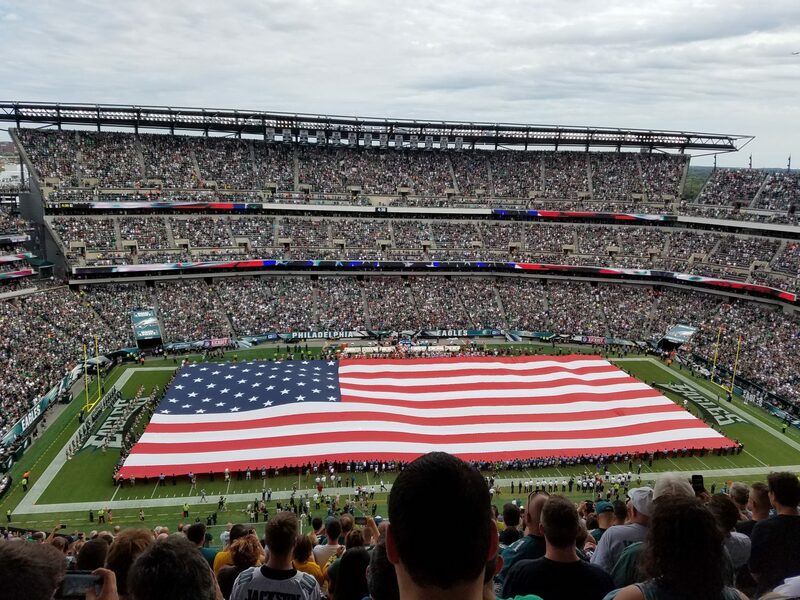 Eagles starting quarterback Sam Bradford started the game, but if you were in attendance and happened to miss it, who could blame you? Sam was in the game for an entire three plays, which wasn’t even enough time for your cheese cup to be infiltrated by a single Chickie’s & Pete’s crab fry. Enter Chase Daniels, expensive backup to the stars (or at least to the Philadelphia Eagles), who looked hesitant every time he dropped back to throw. Perhaps his timidness in the pocket was due to being with a new team. Perhaps it was the heat and humidity which had him shaky in the pocket. Or perhaps it was the Seasons Pizza sign which had Chase thinking about a large pepperoni to go following the game. Whatever it was, his ineffectiveness had caught the fans ire. It may have only been preseason, but when it came to the natives showing their displeasure, they were in mid-season form. A reign of boos showered down upon Daniels’ multiple times during the first half, followed by chants of “We Want Wentz” (in reference to Eagles first-round draft pick Carson Wentz). With less than two minutes left before halftime, the fans finally got their wish. Wonder-boy Wentz was supposed to come in at the start of the 3rd quarter, but even rookie coach Pederson must have sensed that keeping his backup in for another series was an exercise in futility, and instead put in the rookie to run the two minute offense. To Wentz’s credit, he came in and played rather well in the time he was in the game. The young quarterback showed pocket presence and an ability to throw the ball away when there was no play to be made, something that many young quarterbacks struggle with early in their careers. Wentz did throw an ill-advised interception in the end zone, but considering that it was his first NFL action, not too shabby. The question automatically becomes – how much action will Wentz see when the real games began? Those playing the role of devil’s advocate will rightfully point out that many of the defenders chasing him on Thursday night may be slicing your deli meat at your local Acme or Giant a month from now. How will he fare against the starters and all-pros of the NFL? That is a question that may remain unanswered for some time, but at least on this night, Wentz showed that he had the tools to play in the NFL. On the defensive side, Jim Schwartz may turn out to be the defensive coordinator we have been searching for since Jim Johnson passed away back in 2009. He has the experience to run a defense and has a stalwart on the defensive line in Fletcher Cox to anchor it. But this night was all about Carson Wentz. In a season where the expectations are not quite on par with past years, he may be the one who holds the key to this team’s future beyond 2016. The Last Word – Perhaps this should be retitled the most RECENT word. Carson Wentz suffered a hairline fracture in his ribs in the 4th quarter of Thursday’s game and the Eagles are hopeful he returns before the end of the preseason. Setback #1 for Wonder kid Wentz…hopefully not a sign of things to come for your 2016 Eagles…. This entry was posted in Eagles, football, NFL, Sports, Uncategorized and tagged carson wentz, NFC East. Bookmark the permalink.